Mr Bob’s Under the Bridge fosters a community of dignity, compassion and friendship by providing basic necessities such as clothing and hygiene products to the homeless and those who need support in Milwaukee and the surrounding community. Under the Bridge was started by Bob and Sue Burmeister in the fall of 2007. The Burmeisters had been volunteering at a Milwaukee inner city church for years. At the church, along with other volunteers, they served a warm meal every Wednesday. Their passion for the poverty stricken and homeless became a focus to start Under the Bridge. Under the Bridge has been blessed with many clothes, hygiene items, food, and financial assistance. Every week Bob, Sue, and other volunteers sort all items that are donated. So much has been donated that they moved from their garage to the basement of Advent Lutheran Church in Cedarburg. Once the items are sorted, they put together care packs. A care pack consists of a warm coat, hat, gloves, scarves, hygiene items, books, and some sort of snack. Care packs are labeled according to size and then distributed to the homeless in Milwaukee on Saturday mornings. Monetary and item donations are continuously accepted. 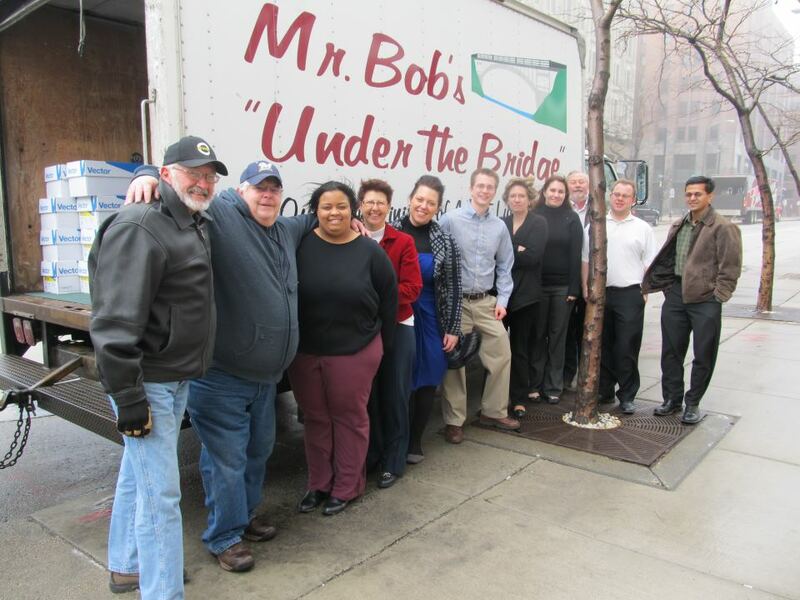 On average, 125 people every week benefit from Mr. Bob’s Under the Bridge and the organization and volunteers have made a year round commitment to serving Milwaukee’s homeless community. Thank you for your interest in our ministry. In May 2012, Mr. Bob’s Under the Bridge became a 501(c)(3), enabling tax deductible donations, and established a formal Board of Directors.